Shoeboxes: while great for some things — like housing a rock collection — they might not be the best option for stashing your savings. That's where an interest-bearing Personal Savings account comes in handy. Earn interest on every dollar deposited, plus free money management conveniences like online banking and eStatements. 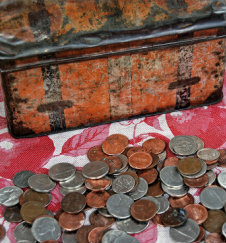 Something else Personal Savings has over a makeshift cardboard box: FDIC insurance. Upgrade your safety net to Personal Savings today. *Monthly service fee is waived for the first 12 months after account opening to allow the customer to build up to the $500 balance requirement.